A myth ties the origins of tea to an errant gust of wind that blew tea leaves into a Chinese emperor’s hot water more than 4,700 years ago. Since that lucky first brewing, tea has become the second most popular beverage in the world (behind water, of course). The industry has grown into a $20 billion behemoth that sells everything from pedestrian PG Tips to luxurious Yunnan golden tips. Tea pickers in Assam, India. Yet that industry and the farmers that rely on it for their livelihoods could be in hot water as the climate changes. Coffee’s struggles with a changing climate are well-documented, but the impacts on tea are just coming into focus. Early research indicates that tea growing regions could decline in some parts of the world by up to 40-55 percent in the coming decades and the qualities, particularly for high end teas, could also change. “Crystal-ball gazing, there certainly is the case that some countries growing tea might not be growing tea in the future or certainly growing less,” Ann Marie Brouder, a sustainability advisor at Forum for the Future, said. Planting a tea bush is a decades-long investment, one not easily moved or replaced. That means to prepare for future changes, farmers and companies need to act if not now, then soon if the tea in your mug is going to be there in the future. “Tea bushes are consistently planted for 60 years so it’s the same bush you’re plucking every year rather than say a crop of wheat. It’s more responsive to the climate rather than the weather,” Ellie Biggs, a geographer at the University of Southampton studying tea in India, said. On late spring mornings, you’ll find farmers across China’s Yunnan province following trails worn by years and years of footsteps in the pre-dawn light. Their pink rain ponchos stand out in the misty hillsides covered in vegetation. Their destination? Small plots of tea bushes tucked away in clearings among the oak-dotted hillsides where the first flush of spring has sent two fresh leaves spreading out to the edge of each branch. The tea harvested in spring and again in fall is a vital source of income for farmers in Yunnan province, one of China’s least developed provinces. When the time is right, farmers will process those twin tips into some of the finest tea in the world, fetching more than $100 per pound for the highest quality teas (or $1,000 a gram for even higher grades if you’re a collector with money to spend). And the timing is everything, right down to the hour. A farmer in Yunnan walks in the mist to their tea garden. “The flavor can change from morning to afternoon because of (shifts in) the concentration of amino acids and chemistry. It’s a really a micro kind of thing,” said Bob Heiss, an author and co-owner of Tea Trekker. Yet background climate shifts are starting to play a role in altering tea quality in Yunnan on much more than a micro scale. Stepp is part of a consortium of researchers whose goal is to explore the hitherto unexplored impacts of climate change on the Yunnan region’s famed teas. Their early findings suggest that average daily precipitation has declined during the wet season and increased during the dry season, though there are large differences across Yunnan. By mid-century, under a high greenhouse gas emissions scenario, climate models indicate that trend could reverse with a slight overall decrease in rain during the dry spring tea harvest and a slight increase during the monsoon harvest. In a preview of what’s to come, recent wet monsoon conditions led to a 50 percent increase in the quantity of tea produced, but a 50 percent decrease in some of the compounds that give Yunnan teas their distinct flavor, in essence diluting the tea. Colin Orians, a biologist at Tufts University who is helping lead the project, is spearheading the chemical research. And Orians, Stepp and other researchers involved will also be sitting down for the occasional cup of tea (no crumpets, though) to observe how those chemical changes translate to something everyone can understand: the taste of tea. Tracking year-to-year changes won’t necessarily reveal the chemistry of climate change, but it will create a key baseline to measure future changes against and provide farmers and tea buyers with another piece of information on what to expect in a given year. Beyond climate data, Stepp and Orians have also been interviewing farmers about their perceptions of rainfall. The majority of farmers they’ve interviewed so far have noticed that rains have become more unpredictable and temperatures have risen over their lifetimes, with the former having the largest impact on tea quality. Some of that could be tied to deforestation across the border in Burma, but rising greenhouse gas emissions also have a likely role. More than 600 miles separates Yunnan from the Assam region of India and the landscapes couldn’t look any more different. Vast tea plantations stretch across the Brahmaputra River floodplain, with shade trees frequently breaking the flat horizon to protect workers and tea plants from the scorching tropical sun. The lower elevation and tropical latitude ensure that Assam is warm and humid almost year-round, with the Indian Monsoon providing a blast of torrential summer rain. 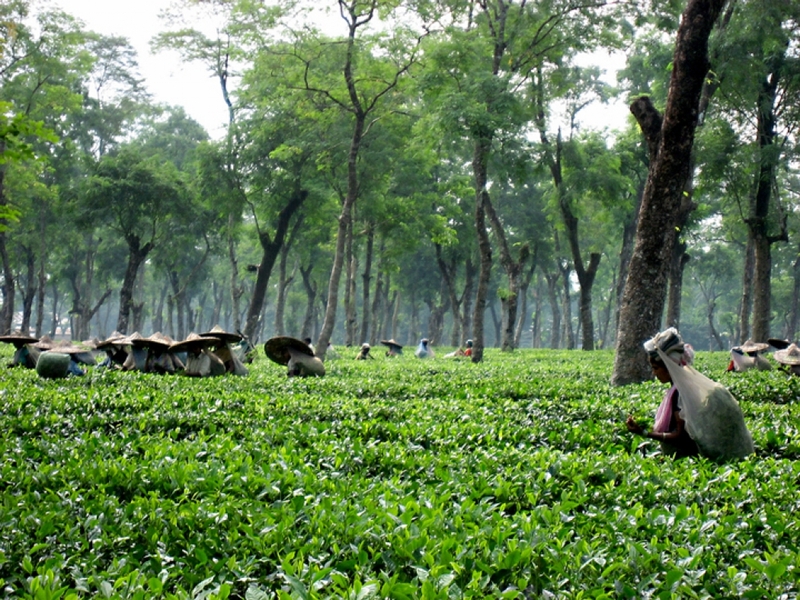 The warm climate means that Assam tea, which accounts for 17 percent of all global tea production, sits right on the edge of tea’s growing range where rising temperatures are already being felt. A tea picker in Assam, India. Biggs is working with researchers at the Tocklai Tea Research Institute (TRI) in Johrat, India to examine what aspects of climate change will have the greatest impact on tea yields. Heat is the most obvious tie for the region, but a shift in the Indian Monsoon is also messing with plants. Recent research shows that the Indian Monsoon is being punctuated by more intense wet spells, which can waterlog plants causing root rot. Biggs and her colleague in Assam, Niladri Gupta, are also analyzing data on temperature and humidity and comparing it to tea yields in a given season to tease out what climate factor is playing the biggest role in affecting yields now and what the future might hold. From there, they can make specific recommendations on how to cope with those climate impacts in the future, particularly for smallholder farmers that produce about a third of Assam’s tea and might not have the resources of large corporations also producing tea in the region. 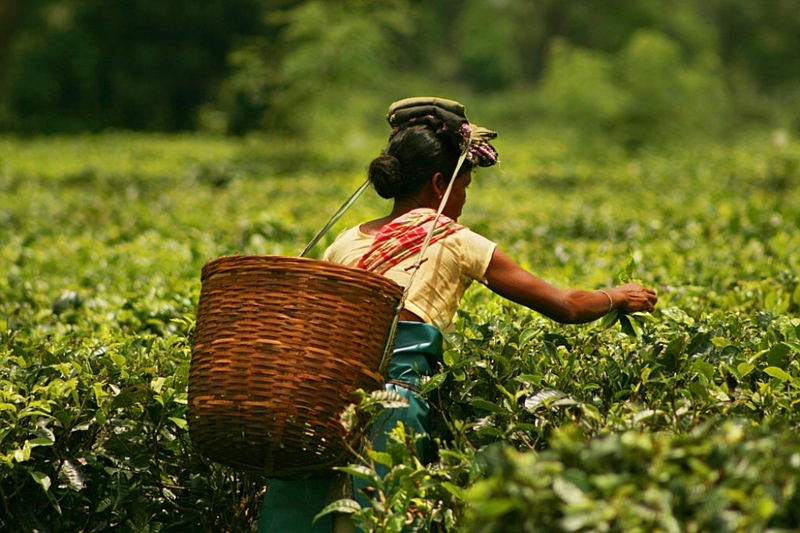 “In Assam, India, unpredictable rainfall and dealing with that unpredictability is what many tea producers say is the critical factor,” Brouder, the advisor at Forum for the Future, said. Beyond Assam, Brouder said that climate change turned up as the No. 1 concern for tea growers based on surveys she’s conducted with growers, buyers and traders as part of project called Tea 2030. Their worries are based on recent fluctuations in growing conditions as well as early efforts to project future changes to tea-growing regions. 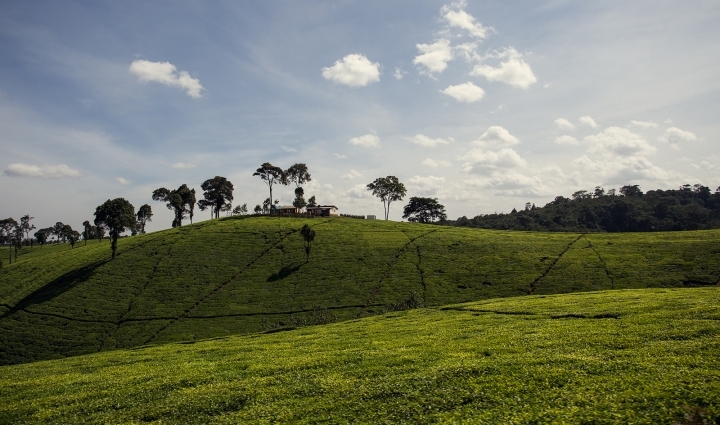 Some of those efforts suggest that tea-producing areas in some places, notably East Africa, could decline by as much as 55 percent by 2050 as precipitation and temperatures change. Biggs and Gupta are doing similar analysis in Assam and early signs point to less land and lower yields if warming continues and adaptation measures aren’t taken. A tea plantation in Kenya. But despite these threats, there are reasons for hope that tea from Assam and other locations can still be part of our warmer future. Heiss said microclimates in mountainous terrain like Yunnan or Nepal could help insulate tea farmers and buyers in those regions. “There are southeast facing slopes, northwest facing slopes. There are ways that the fog and mist come in that affect it. On balance, if you’re a tea buyer, then you need to be vigilant and pay more attention. It can be more challenging to find good tea in a certain year, but there’s always someone with good tea,” he said. He’s also seen how farmers adjust to changing conditions already. During the summer of 2013, an extreme heat wave baked eastern China and had the potential to destroy not just that year’s crop of tea, but tea gardens across the region. “Farmers there took the time to find out from people who had similar drought or heat problems, when you should apply water to the bushes so you don’t make the problem worse,” Heiss said. By relying on evening irrigation and reducing tilling around stressed plants, Heiss said farmers were able to produce a limited crop and prevent a mass die-off of plants, which would’ve been a huge hit to farmers’ livelihoods. A study released last year tied the heat wave, in part, to climate change. The efforts to adapt to that heat wave as well as future shifts is exactly the type of lessons farmers will need to learn to keep producing quality teas in a warming world. Luckily, that’s something already happening. “The amount of effort farmers have put in over hundreds and hundreds of years has really created all this variety of teas and production methods. It’s empirical science, they’re just doing it in the field and seeing what happens,” Stepp said.